Our domain expertise has enabled us to come up with an excellent collection of Dandiya Sticks. The high-grade raw material is procured from the trusted vendors of the market to manufacture these sticks in compliance with the set industry standards and norms. Clients can avail these sticks in various attractive designs to meet the variegated demands of our customers. Wooden dandiya stick is used for wedding and also for gift purpose..available in different colours and different designs.. Designs & colours all vary. Fancy Dandiya wood sticks covered with colorful Chundadi. We are one of the best manufacturer of Handmade Dandiya Sticks. 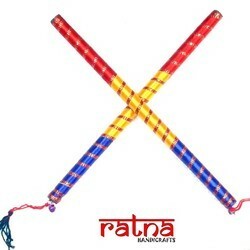 We have been able to offer our clients a qualitative range of Handmade Dandiya Sticks. We are offering all vareity of Dandiya Sticks. 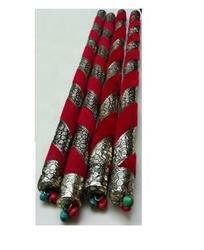 Dandiya sticks are used mainly in Navratri festival.These can be availed at most competitive price. Aluminium Half Cut Dandiya, Size/Dimension: 14"